What Does the Term "Calving" Mean? Calving is a birth process that results in offspring. The substance of both mother and baby can be warmly mammalian or it can be cold as snow. A calving separating parent from child can be long and drawn out or abrupt and shattering, but Mother Nature is always the midwife. For the friendly cow all red and white on the farm, calving means giving birth to a baby, called a calf. Calving occurs after approximately nine months gestation, just as in humans, but if a cow is subjected to too much summer heat, she may calve early. A normal calving, from onset of labor to cleansing (passing the afterbirth), should be completed in about 14 hours maximum. If any stage lasts too long or the calf does not emerge front feet first, followed immediately by the head nose-first, the rancher should consider calling in a veterinarian for advice and assistance. Some cows, however, prefer to calve in the fields and will leave the herd and hide to have their babies, then just show up for feeding or milking with a new calf, requiring no assistance at all. Animals other than cattle and their close relatives go through calving, too, and their offspring are referred to as calves. These include giants like elephants, hippos and rhinos and smaller hoof stock, such as moose, elk and gnu. Oddly enough, calving also applies to some of the marine mammals, specifically whales, dolphins and manatee. Calves aren't always born to living creatures. 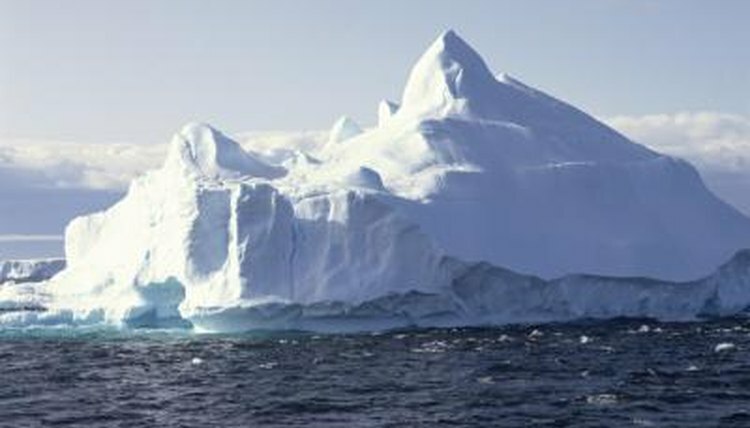 Glaciers, enormous, slow-growing and slow-moving ice sheets found in the icy regions of the world also go through a process called calving to produce their babies, which are called, not calves, but icebergs. A combination of factors, including glacier movement and other stresses, causes huge chunks to separate from the ice cliff where the glacier meets water (ocean or lake) with a thundering crash and a dramatic splash. The new baby iceberg may be as large as some islands. Once separated from its parent glacier, it drifts away. In the sea, it's carried on ocean currents potentially to become a menace to navigation until warmer weather and water cause it to melt and disappear. Calving glaciers in Alaska are a major tourist attraction. Tidewater glaciers -- those that calve directly into the sea -- go through their birth pangs in full view of cruise ships, to the delight of the passengers from a safe distance. Since the 1980s, though, some of Alaska's glaciers have been shrinking at an increasing rate. Some have retreated into shallow bays where the large ships cannot go. This may be due to climate warming, or it may just be part of their normal advance-and-retreat cycle. If these glaciers continue to become less accessible or stop calving, those wishing to watch this natural spectacle may have to reroute their trips to include Norway, Greenland and Antarctica, disrupting a portion of Alaska's tourist trade.